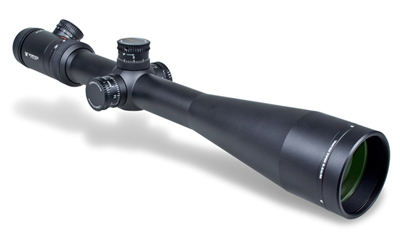 The Vortex PST Rifle Scopes or Vortex PST (Precision Shooting Tactical) range capitalizes on well-developed military-grade material, and abundant windage and elevation adjustment to render itself suitable for dual use - Shooting Tactical and Hunting. Its complementing reticle as well as turret measurements facilitate accurate, quick dialing of shots. The list of attributes is inclusive of XD Lens Elements with extra-low dispersion (XD) glass, XR Fully Multi-Coated lenses to increase light transmission, Precision-Force Spring System for utmost repeatability and ease of adjustment, Precision-Glide Erector System for smooth magnification changes in tough conditions, O-ring and Argon gas purging for water and fogproofing, Hard Anodized low-glare matte finish, Fast Focus Eyepiece for quick and easy reticle focusing, and built-in accuracy attributes. In addition to that, features like ArmorTek technology safeguard the lenses from the evils of scratches, oil and dirt. What makes the range ideal for intense, precision shooting is the fact that they're built on a one-piece 30mm aircraft-grade aluminum tube, especially conditioned to survive relentless weather conditions, sudden shocks and rough handling. This ensures the scopes will not give in or fall apart by acquiring stress from big calibre rifles.